I have added this article from a post from Prof. Marc Bekoff – short bio below. It is a summary of a more detailed report by 16 well regarded scientists entitled Cambridge Declaration on Consciousness. I have read both and confirm that their findings concur with my own conclusions which is also based upon scientific research in this field. A thorough summary of what we know shows skeptics ignore solid scientific data. For an essay I wrote for New Scientist magazine called “Animals are conscious and should be treated as such” about the Cambridge Declaration on Consciousness, there is a wonderful cartoon of animals, including a fish, sitting around a table discussing these issues (reprinted here with permission of the artist, Andrezj Krauze). The print copy was called “Welcome to our world,” and it’s about time we did so with open hearts. 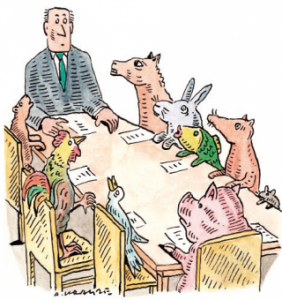 Concerning this exceptional report, at INRA’s website we read, “This INRA collective scientific expert report is based on a critical review of international literature on animal consciousness. 659 references selected from the Web of ScienceTM Core Collection (WOS) database were studied by 17 experts, including 10 INRA experts, from different scientific fields (biologists, cognitivists and philosophers). 75% of these publications come from international scientific journals, 33% of which were published after 2010. INRA’s Delegation for Scientific Expertise, Foresight and Advanced Studies (DEPE) coordinated the report. Here are some snippets from this study to whet your appetite for more. Caution is required before excluding consciousness in species not having the same brain structures as the mammalian ones as different neuralarchitectures may mediate comparable processes. Considering the limited amount of data available and the few animal species studied so far, we conclude that different manifestations of consciousness can be observed in animals but that further refinement is still needed to characterize their level and content in each species. … the overall picture obtained from the large range of species considered strongly provides evidence for different types of consciousness in both livestock and fish. We provide a few examples of higher levels of consciousness in domestic livestock: in poultry, hens can judge their own state of knowledge suggesting they are conscious of what they know or do not know. Pigs can remember what events they experienced, where, and when. Several other examples of cognitive capacities potentially underlying consciousness in domestic livestock are also available, such as recognition of individuals in sheep and cattle. Collectively these studies and those on wild and laboratory species, clearly support the hypothesis that domestic livestock species are capable of complex conscious processing. Livestock species, such as poultry, pigs, and sheep, exhibit cognitive behaviours that seem to imply levels and contents of consciousness that until recently were considered exclusive to humans and to some primates. That is even more the case for fish and invertebrates that until recently were not even considered as sentient. The level of respect due to the animals is driven by the understanding of the forms of consciousness accessible to different animal species. Broadly speaking, we can say that the development of the cognitive sciences has resulted in the recognition of cognitive capacities in many species of animals (particularly mammals and some birds), including the capacity to experience a range of mental states and thus the possession of a mental universe much richer than that of mere existence as a sentient being. And yet this scientific development has coincided with the development of contemporary livestock production systems in which animals are, in the view of animal welfare advocates, increasingly treated as mere machines. In laboratory research, animals are likewise treated as though they were nothing but tools. Inquiring into the cognitive capacities and forms of consciousness manifested by various animal species thus results in a tension between a “thing to respect” in animals, which tends to expand, and a human behaviour that in practice respects the animal less and less, at least insofar as the public opinion understands it. All in all, similar to the Cambridge Declaration on Consciousness and other documents, the INRA report provides conclusive evidence that nonhuman animals are conscious beings and it’s high time to put the debate about whether they really are conscious to permanent sleep. The important question at hand, then, is what are we going to do with this information? In our book called The Animals’ Agenda: Freedom, Compassion, and Coexistence in the Human Age Jessica Pierce and I wrote about what we call “the knowledge translation gap,” referring to the practice of ignoring tons of science showing that other animals are sentient beings and going ahead and causing intentional harm in human-oriented arenas. On the broad scale, it means that what we now know about animal cognition and emotion has not yet been translated into an evolution in human attitudes and practices. For more on the idiocy of the AWA’s misclassification of rats, mice, and other animals, please see “The Animal Welfare Act Claims Rats and Mice Are Not Animals.” Where have all the scientists gone who know that rats and mice are animals? Why haven’t they spoken out en masse about this egregious and unscientific move? Most likely, it’s simply because it works for them to ignore it. I hope that people who are interested in the general topic of animal consciousness will take the time to look at the INRA report. You can do so in different sittings. All in all, this landmark report is a thorough summary of what we know about animal consciousness and it makes it extremely clear skeptics who say something like, “We really don’t know if animals are conscious” ignore solid science and are dead wrong. It’s time for them to go home and read available scientific studies, end of story.